If you’re going to lots of holiday parties this season, you don't want to get caught with the same holiday hair styles each time. This style is fantastic with your already-styled curls, and is a great to-go look if you have to rush between your office party and your boyfriend’s parent’s party! Great looking waves start in the shower, especially with a look that is best for already styled curls. Apply your hard hold gel in the shower with your hair upside down. Then scrunch the moisture out with a micro fiber towel to create lift. Diffuse your hair upside down to add volume and dry faster. Do not move the diffuser around too much as that will just disturb your curls and frizz-out your waves. When your hair is completely dry, spray upside down with a scrunch spray, then scrunch to help increase the wave and increase the volume. Pull a few loose curls out to leave around your face to give you a sultry style. Lightly part your hair to one side to give the style more drama. Start twisting sections back, but stay with the curl pattern, and pin each curl. Do not break any curls apart or try to make it look perfect. When pinning the top back, try to create lift by not smashing down on your head or pulling the waves back tightly. If you need to, you can slightly tease the top section just to give you volume. The underneath sections can be twisted up and around to give variation to the look. You can pin it in the middle of your head or pin it to a side to change it up. Make sure you cannot see the bobby pins, they need to be hidden. 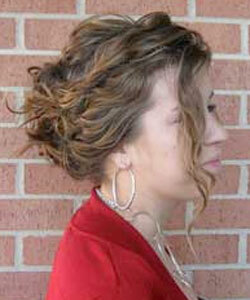 Do not pin the hair tight to your head, the style needs to stay loose, but feel secure. Find more wavy holiday hair inspiration with our favorite quick & easy wavy hairstyles for busy mornings! When your look is finished, spray your entire head with a hard hold spritzing hairspray.